A rare 35 year old Benromach that comes from the old period before the distillery was mothballed in 1983. 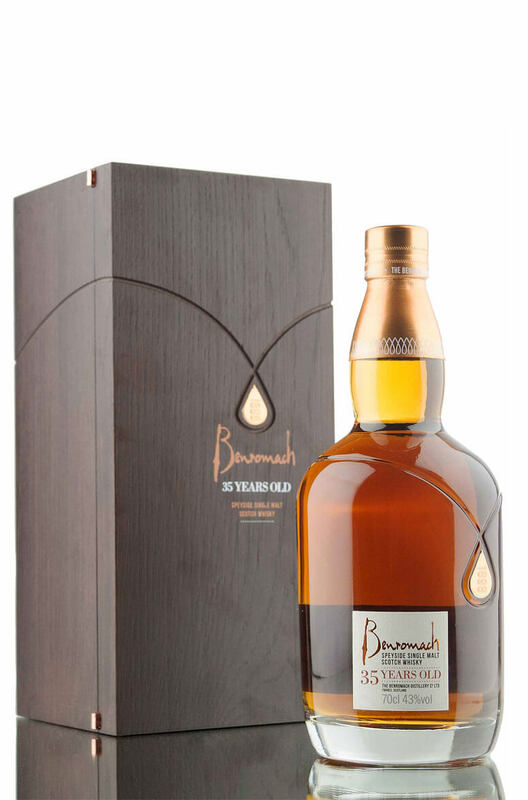 Benromach whiskies from this period are quite different to the current style and are usually more delicate, less smoky but refined, classy and in no way overly oaked or astringent. This one offers up some vibrant fruit, expressive tropical flavours and a creamy, rich mouthfeel. It may surprise many that it came from a 1st fill sherry cask as the whisky is fresh and vibrant without too much earthiness. Aromas (with water) Sherry influences with honey, blackcurrant and beeswax polish aromas, complemented by a subtle hint of cloves. Aromas (without water) The nose offers rich sherry influences with orange marmalade, kiwi and grapefruit aromas, complemented by gorgeous cinnamon spice. Palate (with water) A fabulous combination of white pepper followed by dried tobacco, dewy stewed pear, raisin and zesty orange peel flavours, heightened by a delicate edge of charred oak…the result of lingering for over three decades in oak casks. Palate (without water) Initially, it is sweet on the palate with honey, fruitcake, ripe banana and melon flavours. Watch out for the smooth white chocolate edge as it develops, combined with a soft menthol note, giving a full body and long and smooth fruity finish. Types of Barrel used for Aging Matured in first fill sherry casks. A fantastic and richly flavoured malt from the bygone era at Benromach before the distillery clos..
A fantastic Benromach from 1976. This has been matured in a combination of refill and first fill ..